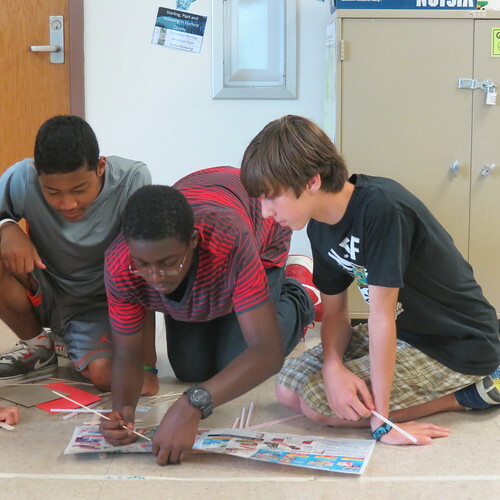 Congratulations to all the students who attended CERDEC’s Math and Science Summer Camp. The closing ceremony for this year’s camp marked the nineteenth year of CERDEC efforts to support science, technology, engineering and math (STEM) education in the community. This year’s camp was open to students entering grades five through ten. The fifth and sixth grade campers focused on electric innovations, using snap-circuits to learn the basic principles of electricity. The students then used this knowledge to design working electronic devices like buzzers, speakers and remote controlled vehicles which were then used in team competitions. Hey, you can’t be the summer camp Jeopardy champ if the buzzer you designed doesn’t work. The seventh and eighth graders learned about engineering marvels by studying the basic principles of structural design. How else could they build a house of newspaper or “ruggedize” a candy cane? Oh yeah, they built bridges, towers and shelters too. Freshmen and sophomores designed and built radios (short wave and am/fm) and remote controlled robotics while studying the properties, frequencies and transmission of radio waves. The Science and Math Summer camp is just one of several STEM programs offered throughout the year by CERDEC’s Educational Outreach Office. The programs, which are designed to foster student interest and expand their knowledge, operate in accordance with the President’s “Educate to Innovate” initiative and the US Army’s ongoing commitment to STEM Education.